Happy Global Running Day friends! I can't believe the day is already here (and practically gone). Where has the year gone?! I did a few things completely out of my norm today to celebrate. Number one was deciding to go on a group run. 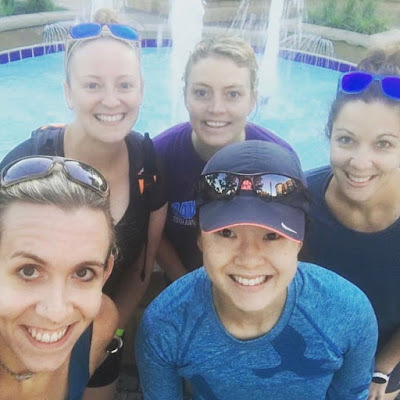 The Oiselle Illinois Volee team had a few different options for meet ups on this wonderful day, but the one I thought would be best was in the suburbs (Downers Grove) and in the morning – meeting at 5:30am. A lot of other events were happening at 5pm in the city, which I couldn't make in time after work. This would be only my third group run to date. I tend to avoid them because I'm on the slower end and feel bad making people slow down for me. Second, by joining the group run, I had to wake up at 4:15am to get there in time. I think most of you know I'm not a morning runner. Usually, the only time I wake up early to run is for a race, and even then it's begrudgingly. My husband didn't believe that I would make it to the meet up, because he knows that I'll often set my alarm early to try run or get my day started with errands, and then just hit snooze a bunch until I turn off my alarm completely. I knew I would make it happen because I made a verbal commitment (sort of, I said I was going to try really hard to make it) and that the idea of meeting with other people would get me up. When it's just me running on my own, I know I don't HAVE to get up and can go later in the day, so I prefer to sleep in. So, I actually got out of bed and only left 5 minutes later than I intended, but that was leaving early so I could find my way — give myself a little extra time to get lost or find parking. Turns out that was unnecessary, as I found the place no problem and parking was easy. I introduced myself to Ali, Heather, Beth, and Lena and after some chatting and a photo, we were off for about a 3 mile run. The sun was starting to rise and we felt the humidity pretty quickly. I usually do run/walk intervals, but I figured I would try my best to keep up. I think they ran slower so I didn't fall too far behind, which was very nice of them (they had mentioned going for about 10:30... so they were about a minute slower thanks to me haha). After about 1.5 miles out, we turned around and headed back. Mile one and two were about 11:24 pace, which is fantastic for me. Heather and I chatted a bit the next mile, and then around mile 2.5 I had some horrible stomach problems and had to walk. She was nice enough to walk with me, since it was her rest day anyway (and because she's clearly super nice). I tried to run a bit more, but the horrible feeling wouldn't go away. You all know it - when you need a bathroom immediately, but have to wait. We've all been there, but didn't make it any less embarrassing. And why do I talk about embarrassing things here? Well, because I like to keep it real haha. But seriously, I was thinking what a great first impression to make. Woof. At a busy corner the other girls waited for us to cross all together, but then I had to walk again for fear of a disastrous moment. 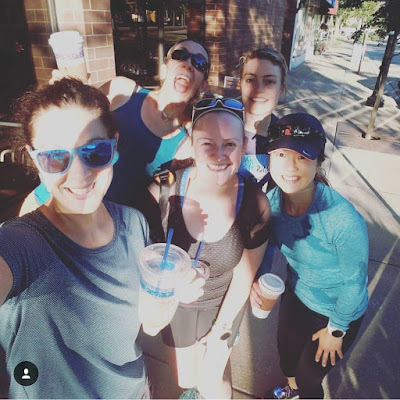 So, we finished up the group run at a walk with 3.45 miles. It was a real bummer that I had tummy issues because I was doing really well the first 2 miles and I wanted to see if I could run all 3+ without a walk break. Also the fact that it's rare for me to have these problems when running. I think it's happened me maybe two or three times over the past six years. Oh well, maybe next time. And like the girls kept reassuring me, it happens to everyone. We finished at Peet's Coffee and went inside to grab some. I used their bathroom first, of course, then ordered a berry hibiscus lemonade. We went outside to chat and talk about possible future meet ups and parted ways. Overall we were together for about an hour. It was so nice to meet some of my teammates – I've only been on the team for about a month and a half and hadn't had the chance to meet up with anyone yet. Plus, being shy, I often convince myself not to go to these sort of things. They were all so nice, encouraging, and friendly. I'm happy to included with such a strong, empowered group of women and I look forward to more meet ups. After the run. You can't see just how sweaty I was haha. I'm glad I went out of my comfort zone today. Running has helped me push my limits, often going out of my comfort zone, and helped me become more outgoing. Shout out to these lovely ladies for being so nice and welcoming me into the group. I love runners. They never make you feel bad for being slower or if you have any kind of issue like I did today. It's a group of supportive people and it's why I've fallen so in love with the sport. How did you celebrate this day? Maybe you also want to register for some races or grab yourself some gear? Check out my discounts page to see if anything there strikes your fancy. Any deals you know of that are can't miss? I am so glad you came! It was great to meet you in person. Hopefully we can run together another time (not so early in the morning! ).